The Armed Forces Expeditionary Medal was established by Executive Order 10977 signed by President John F. Kennedy on December 4, 1961. 1. Description: On a bronze medal, 1 < inches in diameter, an eagle, with wings addorsed and inverted, standing on a sword loosened in its scabbard, and super- imposed on a radiant compass rose of eight points, all within the circumscription "ARMED FORCES" above and "EXPEDITIONARY SERVICE" below with a sprig of laurel on each side. On the reverse is the shield from the United States Coat of Arms above two laurel branches separated by a bullet, all within the circumscription "UNITED STATES OF AMERICA". 2. Ribbon: The ribbon is 1 3/8 inches wide and consists of the following stripes: 3/16 inch green 67129; 3/16 inch golden yellow 67104; 3/16 inch spicebrown 67196; 3/16 inch black 67138; 7/16 inch bluebird 67117; 1/8 inch ultramarine blue 67118; 1/8 inch white 67101; 1/8 inch scarlet; 7/16 inch bluebird; 3/16 inch black; 3/16 inch spicebrown; 3/16 inch golden yellow; and 3/16 inch green. 3. Criteria: a. 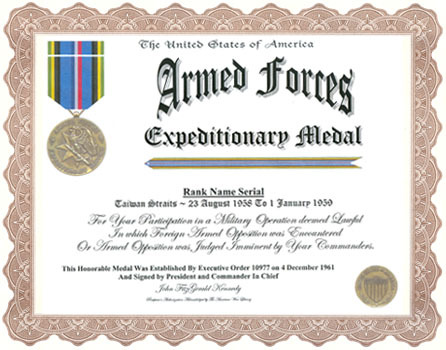 The Armed Forces Expeditionary Medal may be awarded to members of the Armed Forces of the United States who after 1 July 1958 participate as members of U.S. military units in a U.S. military operation in which service members of any Military Department participate, in the opinion of the Joint Chiefs of Staff (JCS), in significant numbers and encounter during such participation foreign armed opposition, or are otherwise place in such a position that in the opinion of the JCS, hostile action by foreign armed forces was imminent even though it does not materialize. a. Medal (regular size): MIL-DTL-3943/230. NSN 8455-00-082-5638 for set which includes regular size medal and ribbon bar. b. Medal (miniature size): MIL-DTL-3946/230. Available commercially. c. Ribbon: MIL-DTL-11589/12. NSN 8455-00-082-2344.
d. Lapel Button: MIL-DTL-11484. Available commercially. e. Streamers: MIL-S-14650. Manual requisition in accordance with AR 840-10. 5. Background: a. During the late 1950s, it became apparent that a medal was needed to recognize the services of the Armed Forces who participated in the increased involvement of the American military in peacekeeping activities. As a result, President Kennedy established the Armed Forces Expeditionary Medal, per Executive Order 10977, dated 4 December 1961, for operations on or after 1 July 1958.
b. In a memorandum dated 20 December 1961, the Deputy Assistant Secretary of Defense requested that The Institute of Heraldry submit proposed designs as soon as possible. Proposed designs were submitted on 25 January 1962 and a design, created by Mr. Jay Morris, was tentatively selected. The design was submitted to the Commission of Fine Arts for comments prior to approval by the Deputy Secretary of Defense on 24 April 1962.
c. The selected design uses the eagle to represent the strength of our Armed Forces, and the sword, loose in its scabbard, denotes the readiness to serve wherever needed, as further suggested by the compass rose. d. At the present time, JCS has designated 22 operations for which the Armed Forces Expeditionary Medal may be awarded. A bronze service star is worn to denote second and subsequent awards of the Armed Forces Expeditionary Medal. 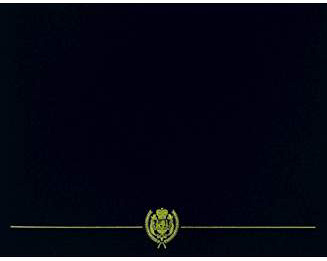 Each Service may authorize the use of campaign streamers for operations in the designated areas. The Army has authorized campaign credit and display of streamers for three areas: Grenada, Panama and the Dominican Republic. The Air Force has authorized display of streamers for all 22 operations. The Navy authorizes display of three silver stars and four bronze stars on the streamer representing 19 operations. SEC. 2. The medal, with ribbons and appurtenances, shall be of appropriate design approved by the Secretary of' Defense and shall be awarded by the Secretary of the military department directly concerned, and by the Secretary of the Treasury with respect to the United States Coast Guard, under uniform regulations to be issued by the Secretary of Defense. THE WHITE HOUSE, December 4, 1961.